The 1/2-inch Orbit zinc impact sprinkler is solidly built of heavy-duty metal. It can water areas up to 80 feet in diameter (40 ft. spray radius) and is excellent for large area coverage. This impact head has a deflector shield so areas that do not need water will not get it. This Orbit sprinkler head also features an anti-backsplash arm that allows it to rotate quietly and smoothly. 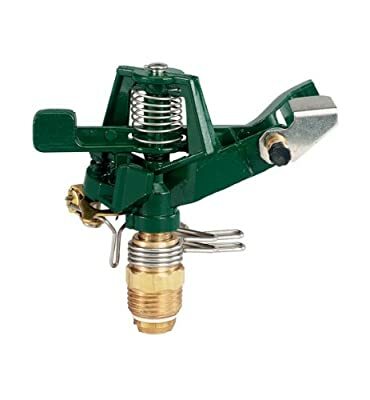 Sturdily constructed, this brass sprinkler will work in a series of multiple sprinklers making a full lawn watering system or it can be used by itself. This Orbit zinc impact sprinkler will last, giving years of dependable watering. Features and Benefits: Head solidly constructed of zinc, Covers areas up to 80 feet in diameter, Smooth rotation occurs due to anti-backsplash arm, Deflector shield ensures water sprays only in needed areas.